Experienced Fishing Guide Service and shore lunches are available on a request basis to add into your fishing Vacation here.. This can be part of a week long guided fishing vacation, or requested for the first day or two until you get to know the lake a bit better. We specialize in Walleye, Northern Pike, Smallmouth Bass, Musky (Muskie) fishing plus other fish species like Perch, Sauger and Crappie. 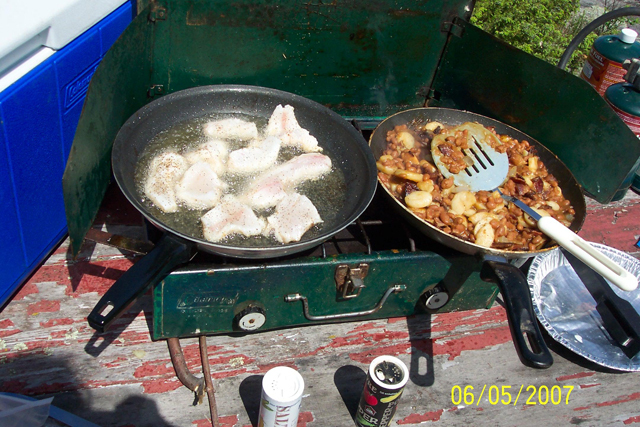 Enjoy the great outdoors while stopping for a shorelunch on an island on Lake of the Woods. Sure is nice to have a fishing guide so all you have to do is fish and relax and have fun! Shore lunch is cooked over an open fire when permitted. ***2019 rates: 3.5% Discount if you pay deposit with check & pay balance with cash - does not apply to Guide, gas, bait, licenses. Gasoline prices , Bait & Licenses are at prevailing prices.